Common loon; photo by Matthew (jackanapes) on Flickr (noncommercial use permitted with attribution / no derivative works). Loons are known for their cries, wails, and yodels - their eerie, echoing calls are a distinctive feature of Minnesota’s northern lakes. Approximately 12,000 of these unique birds make their summer homes in Minnesota. 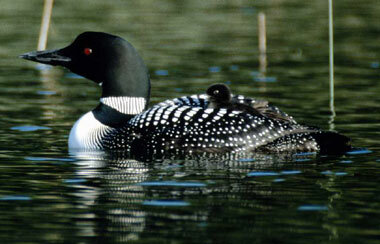 Loons are large black and white birds with red eyes; they have wingspans up to five feet and body lengths up to three feet. 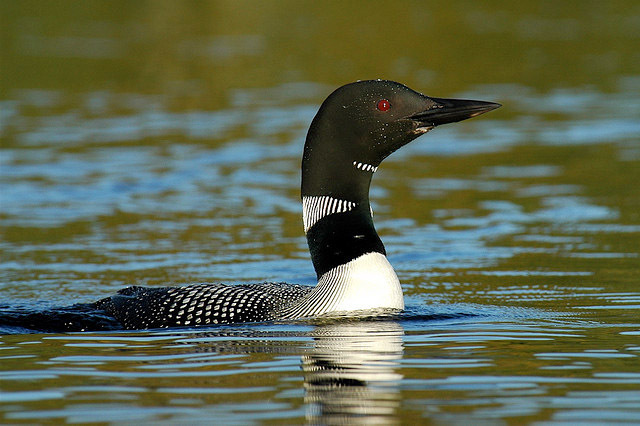 Although clumsy on land, loons are high-speed flyers and excellent underwater swimmers (they will dive to depths of 90 feet in pursuit of fish). Common Loon with chick on board (MasterClips photo). 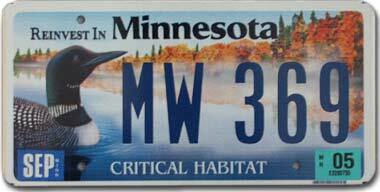 Minnesota "Critical Habitat" license plate featuring the state bird (common loon); photo by Norm Russo (used by permission).